"Be an Alpha Phi girl, We Want you!" George Mason Panhellenic Formal Recruitment will be held on September 15-18th, 2017. Recruitment is a fun-filled four days of socials, during which sororities share their sisterhood with potential members. These days allow you to get a glimpse into the personalities and values of each of the 7 chapters on campus. Just as sororities are looking for the right women to join their chapters, you should be looking for a chapter that fits you. Each sorority has something unique to offer and with 7 chapters, you will be able to find a group of women with whom you identify. 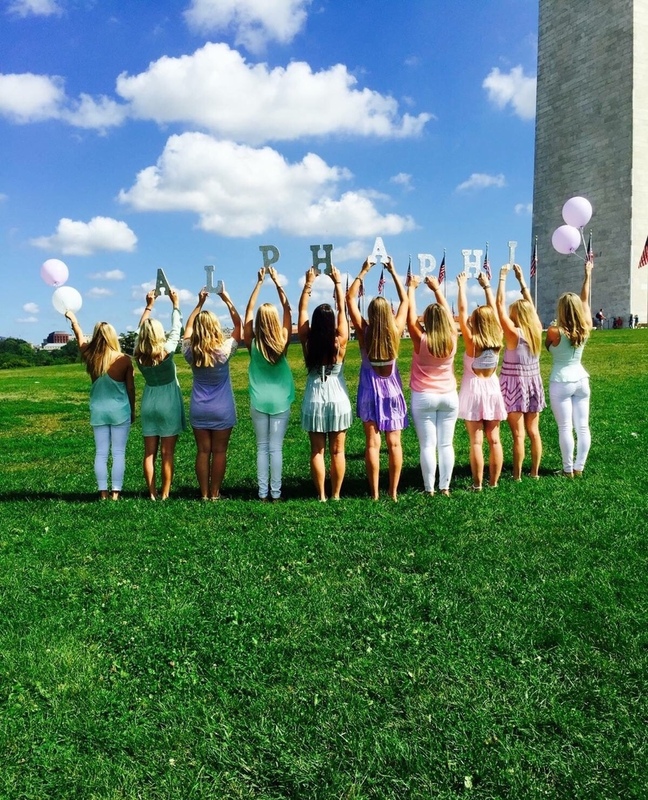 If you would like to register for recruitment, click here. My name is Nikki Hart and I am so honored and humbled to be Alpha Phi’s Vice President of Membership Recruitment for the Eta Lambda chapter here at George Mason! My journey so far being VPMR has been nothing but rewarding and one of the many amazing experiences I have encountered thanks to Alpha Phi. Greek Life was something that I wanted to be a part of ever since I was a senior in high school but I never thought it would change my life the way it has these last three years. Alpha Phi not only gave me my best friends, roommates and future bridesmaids, but it has challenged me every day to be the best version of myself. Alpha Phi is a chapter full of different backgrounds, styles and personalities that all mold together to make one tremendous Sisterhood. My sisters continue to encourage each other every day to reach their goals not only as undergrad students but also as future professionals and leaders in our community. I am so proud to be a leader amongst these amazing women and I can’t wait for you all to meet each and every one of them.